PETER AND THE TRIBUTE MONEY. 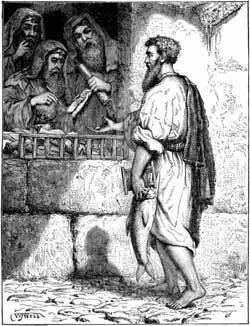 T WAS A part of the Jewish law that all strangers passing among the Jews should pay to the priests of the Temple an offering to the Lord, or tribute-money as it was called. Soon after our Lord's Transfiguration He came to Capernaum, together with His disciples. When they had entered the city, there came to them the priests who usually collected this tribute-money, and they said unto Peter, "Doth not thy Master pay tribute?" But when they had come to the house, Jesus said to Peter, "What thinkest thou, Simon? Of whom do they take tribute; of their own people or of strangers?" And Peter answered Him, "Of strangers." Jesus saith unto him, "Then their own people are free; but lest we should offend them by not paying, go thou down to the sea, and cast in thy hook and line, and take up the first fish that taketh the hook into his mouth. And when thou hast opened his mouth, thou shalt find a piece of money there. Take it and give it unto the priests as tribute for Me and for thee." And Peter went down to the sea and cast in his line, and took a big fish. And when he had opened its mouth he found the piece of silver, and took it to the men in payment of the tribute. This tribute was collected to pay the expenses of the Temple worship. Jesus sought to show that, as He himself was the Son of God, the King for whose service the tribute was paid, He might justly be exempted from paying it; yet to save giving offence He miraculously provided the piece of money to pay tribute for Himself and Peter.